GM is one of the largest automotive manufacturers in the world. It has produced vehicles under some of the most beloved brand names, including Chevrolet, Buick, Saturn, Pontiac, and Hummer. It has made everything from flashy sports cars to oversized off-roaders to modest, family friendly vehicles. Because GM has made such a variety of vehicles, it is important that you work with a certified GM auto body shop in Mesa for collision repair. The technicians at Excel Collision and Glass Centers have received extensive training on how to work on a wide variety of GM vehicles, and they have the experience to back it up. 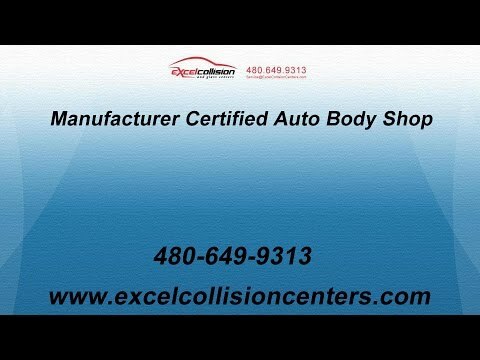 You can work with the technicians at Excel Collision and Glass Centers in Mesa with confidence. Because GM has produced such a wide variety of vehicles, there are a number of auto body shops in the area that can work on these brands. However, we are confident that you will find that Excel Collision and Glass Centers stands out from the rest. We are committed to performing the highest quality of workmanship so that your GM vehicle looks as good as it did before you had the accident. Our technicians have received extensive training to repair GM vehicles, and they receive ongoing training to stay aware of the latest techniques and tools to get the best results. Our staff provides friendly and professional service at every interaction. We offer a lifetime warranty that guarantees the results for as long as you own your vehicle. Just take a look at our online reviews or talk to some of our customers and you will see that we deliver on our promises. We are committed to providing the service and workmanship to be the best body shop in Mesa. Being one of the biggest manufacturers of cars and trucks around the world, General Motors has an incredible amount of brands under their belt. This is the reason why we are proud to be a General Motors certified collision repair center that can service different brands like Cadillac, Chevrolet, GMC, and others. Our convenient locations in Mesa lets you drop your vehicle for a thorough damage inspection in no time. As a General Motors certified collision repair center, we work with original manufacturer parts to make your engine and vehicle frame more durable. We also have original airbags from the different car brands under General Motors that are more resilient in any accident situation. Aftermarket parts tend to break over the pass of time since they are made without any oversight and certification in distant parts of the world. For our customers, the best way to make their vehicle perfect again is to use original manufactured parts that had the extensive oversight needed to make your car more durable. Excel Collision Center understands the diversity of the car models under General Motors ranging from motorcycles to sedans, minivans, and SUVs. Our skilled mechanics have the knowledge and preparation for dent removal and repair for any vehicle under the brand of General Motors in an efficient way. We have the expertise to finish the job in a couple of hours, instead of a couple of days like it normally would in other collision repair centers. Don’t hesitate to give us a call today if you want to know more information about what we offer as the best collision repair center in Mesa. Visit one of our convenient East Valley locations today! We know that you have a busy schedule and that being without your car for days at a time can be a real hassle. While we can’t rush the repairs, we can make the process as convenient as possible. We do that by offering numerous body shops throughout Arizona so that you can find a location that is most convenient to your home or office. We also do that by offering flexible appointment times and by helping to arrange pick up and drop off. Finally, we help by working with your insurance company to file claims or process payment. You are not just another customer to us — you are family. Our technicians want to build a lifelong relationship with you so that we are the auto body shop you choose again and again. We do that by building your trust with consistent results and service. Call us today in Mesa to make an appointment for a collision repair estimate. We’re ready to start building that relationship with you and showing you how we stand out from our competitors.